Hunter Poston has been named the 2019 Star of Life for LifeNet EMS in Stillwater, Oklahoma. A 2013 graduate of Perkins-Tryon High School, Hunter always knew he wanted to do something in emergency medicine, but it was not until college that he realized a career in Emergency Medical Services (EMS) was a possibility. During his last semester of college, Hunter enrolled in an EMT class and fell in love with EMS. A native of Stillwater, Oklahoma, Hunter hoped to get a job with LifeNet EMS after he earned his EMT certification, but the company was not hiring at the time. So he took a job offer with Life EMS in Enid, Oklahoma, where he kicked off his career. 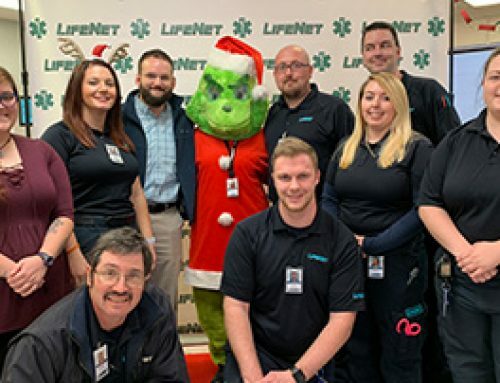 Three months later, when LifeNet did their next round of hiring, Hunter took a full-time role working in his hometown while continuing to work part-time for Life EMS. Hunter enjoyed being an EMT-Basic, but he knew he wanted to do more. He could not start paramedic school until 2018, so he worked towards his EMT-Advanced in the fall of 2017. “I wanted to be able to help out a little bit more, start IVs and other things, until I could start paramedic school” he said. Hunter started paramedic school in 2018 and will graduate in July 2019. He was awarded the Spring 2018 Oklahoma Rural Scholarship to use towards his education at Kiamichi Tech Centers – Poteau. In return, Hunter has agreed to work for at least two years in a rural or under-served area of Oklahoma. Hunter is an avid learner and is committed to ensuring he grows daily as an EMS professional. Hunter was nominated by his peers to be LifeNet EMS’s 2019 Star of Life in Stillwater, Oklahoma. Another colleague echoed those sentiments in nominating Hunter. After receiving the nomination, Hunter was then selected for the award by former Stars of Life and the management team at LifeNet. “I was so excited, and I am honored because I know the past Stars. They are all good role models, and it makes me feel really good to know that I met their standard. It is very encouraging. You often don’t have the perspective of yourself that other people do,” Hunter said as he described the moment he was told he was LifeNet’s 2019 Star of Life in the Stillwater Division.